Successful partnering starts in the executive suite. Be the kind of person that others would like to do business with. At Levi Strauss, they’re living what they say. This privately held San Francisco-based company is letting action speak louder than words. They’re reshaping their corporate culture through dismantling parts of their hierarchy and overhauling how they design, manufacturer, and market their clothing. Former Chief Executive, Robert Haas, a former Peace Corps volunteer and great-great-grandnephew of founder Levi Strauss is being an optimal partner by building ethics into the company’s bottom line through ethical practices, empowerment, and an appreciation of diversity. He embraces empowerment, the practice of putting more power into the hands of Levi’s employees at all levels and encourages them to become actively involved in corporate decision making. Levi Strauss is embracing the belief and practice of partnering throughout their many areas of business. Haas suggests that their emphasis on values is “not just nice behavior” but that it is also smart business. He states, “Consumers are looking more and more to the company behind the product. Companies have to wake up to the fact that they are more than a product on a shelf. They’re behavior as well.” This had much to do with their decision of partial withdrawal from China, citing “pervasive violations of basic human rights” as the reason. Being an optimal partner, whether your a small retailer or a major supplier, is the right thing to do, not just because its ethical, which should be reason enough, but because it pays off, as illustrated by the example of Levi Strauss & Company and for you. Create for yourself the attitude of limitless partnering possibilities. It’s no secret that attitude can and will make the difference between partnering failure and success-and success is what you ultimately want! It’s easier than you think to get into the mindset of “I don’t care” or the “I can’t do it.” It’s your self-confidence that will allow you to become the optimal partner-the pentad I detailed last month will not be complete without you! Roger Tompkins, former vice president California of State Farm Insurance stated, “Managers see people as essentially lazy, somewhat stupid, needing constant direction and prodding to get any work done. Theory Y managers, on the other hand, see people as essentially interested in being productive, ready to work, and to cooperate, (if shown the way and given the tools) and essentially self-starting. When you get caught in the drift of life and/or business, and you will, it’s your partners who will be there for you with strength, energy and enthusiasm to assist you in seeing new and unique solutions to your challenges. This is something on which you could never put a monetary value or price. What you can do is be an optimal partner and reciprocate when your partners, the others in your pentad, are in need. Your partnering alliances have a vested interest in your success, as you do in theirs. To view your daily concerns, better yet-challenges, from a new perspective, requires that you shift your paradigms (beliefs, standards, or models). 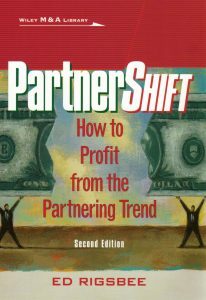 For successful partnering, you must challenge your paradigms and shift away from what is not serving you. Look at it this way: when you look at a tall tree from 50 feet away through a standard 50mm camera lens you see a particular view, not all of the tree. Now change to a macro close-up lens and you see not much of anything. Now change to a wide-angle lens and you see just about all of it. What was different each time? The lens, your filter-each of us filters how the world truly is and that’s our reality. So, change your filter, your vision, and behold all the new possibilities. Successful partnering is not for every business and organization, because it takes you having the capability of being an optimal partner to know if partnering is right for your business. Reasons not to partner may include: You may simply view the world from a place of loss and negativity. You have the market cornered (but for how long), and enjoy the power position of calling all the shots. You may be a loner and prefer to go it alone. Maybe you’re even satisfied to make do with less. You may not desire to build a Successful Partnering Pentad, but let me warn you-you can’t be in business today without partnering to some degree. Maybe it’s partnering with your customers, maybe another area, but you simply cannot operate in a vacuum and survive. If you find yourself having the above negative conversations, find the strength to escape your perceived dungeons. Maybe you’ve heard it called the Platinum Rule, or The Golden Rule Expanded? I heard about this idea from Patricia Fripp in the mid-1980s. Whatever you call it, the concept is, to do unto others the way they would have you do unto them. To be the optimal partner you must see things as your partnering alliance members do, otherwise you’ll greatly diminish your possibilities. Think back to great leaders you’ve had the opportunity with which to interact–haven’t they made you comfortable around them? Sure they may have pushed you to achieve more, but that wouldn’t have been possible, had they not initially built rapport. They somehow have had the ability to get you to want to perform to your highest level of potential, and that’s successful partnering. The same is important for you if you want people and organizations to partner with you. In the Korean business culture the principle of Nunchi, the ability to look in someone’s eyes and understand, allows for a powerful nonverbal communication. Through this process, employees make decisions that reflect how their manager would expect them to decide. Nunchi also exists as a societal binder and is the reason given by some for Koreans’ less outgoing nature as compared to Westerners. As partnering relationships blossom, this further sense of deeper understanding and communication, becomes more real and less theoretical–assisting in alliance harmony. Study nunchi, if you can develop the sense, you will become the type of person to which others will gravitate–the optimal partner.